Henry Whitfield House, built in 1639, is the oldest house in Connecticut and the oldest stone house in New England. State Parks Kent Falls State Park, Scantic River State Park, Gay City State Park, Fort Trumbull State Park. Beaches Pleasure Beach, Harvey's Beach, West Haven Beaches, Lisicke Beach. Museums Academy Hall Museum, Chaplin Museum, Lyman Allyn Art Museum, Stanton-Davis Homestead Museum. Historical Places Connecticut Hall, Bush-Holley House, New Haven Green Historic District, Stanley-Whitman House. Other Places Sabino, Yale Bowl, Lime Rock Park, New London Ledge. The Connecticut Hall is located in Old Campus of Yale University in New Haven. It is a Georgian-style building which was built in 1752. It is one of the oldest buildings in Connecticut and is also known as Old South Middle. It was declared a National Historic Landmark in 1965. It was built under the direction of Thomas Clap and its design was based on Massachusetts Hall at Harvard University. Francis Letort and Thomas Bills were the main architects. The building was added to the National Register of Historic Places on October 15, 1966. The Barnum Museum is located in Bridgeport, Connecticut. It has a collection related to P.T. 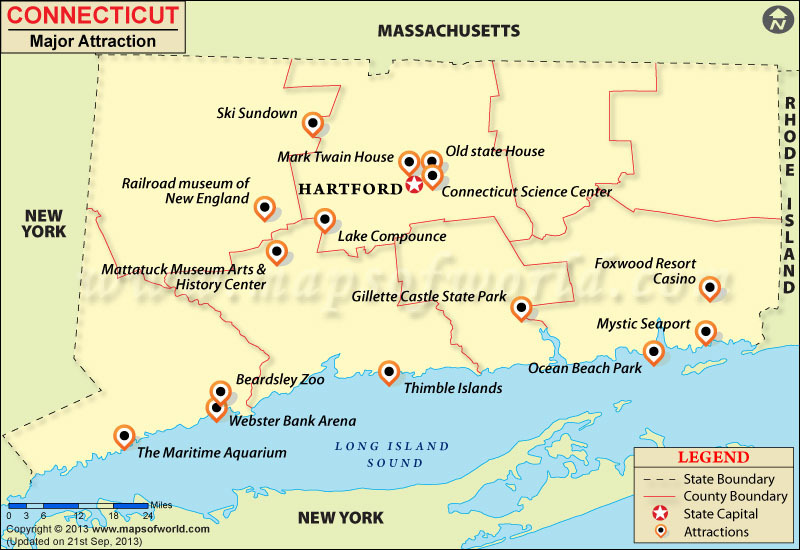 Barnum and the history of Bridgeport. The building, which is home to the museum, was completed in 1893. The museum is a member of the North American Reciprocal Museums programs. It was added to the National Register of Historic Places as a "highly individual structure." It was severely damaged by a tornado that struck the region on June 24, 2010. A 2,500-year-old Egyptian mummy is the oldest artifact in the museum. Kent Falls State Park is located in Litchfield Hills, in the town of Kent. It has a series of waterfalls on the Falls Brook. The park is also home to the replica of a covered bridge that allows visitors to cross the brook and access the falls. It offers bathrooms, picnic facilities, and pedestal grills and is designated Trout Park. Pleasure Beach is the Bridgeport section of a Connecticut barrier beach that stretches 2.5 miles westerly from Point No Point. It is a protected refuge for endangered birds and plants. Portions of the area are roped off seasonally to protect the plover nesting areas. Other animals found in this region are white-tailed rabbits, deer, foxes, and raccoons. The Stanley-Whitman House is located in Farmington. It is a historic eighteenth-century house which was converted into a museum. It was declared a National Historic Landmark in 1960. The collection of the museum includes furniture, decorative arts objects, costumes, tools and functional items from the 17th and 19th century.